This tab of the Options dialog allows choosing features of forms. A form, recall, is a window used to design other windows. There are four check boxes and four editable text boxes showing numeric values. Display grid: if checked, a grid of dots is displayed on a blank form. See display-form-grid. Snap to grid: if checked, controls placed on the form will have their upper-left corner on a grid dot. See snap-to-grid. Snap to Components: if checked, guide lines appear when a control is moved into alignment with another control, allowing controls to be aligned easily. The movement of the control is halted briefly while the line appears. See snap-to-components. Allow overlap: if checked, one control can partially or totally cover another control. If unchecked, overlap is not allowed. If a control is placed so it overlaps another, it moves so it does not overlap when the mouse is released. See allow-component-overlap. Grid X Spacing: the horizontal distance in pixels between dots on the grid. 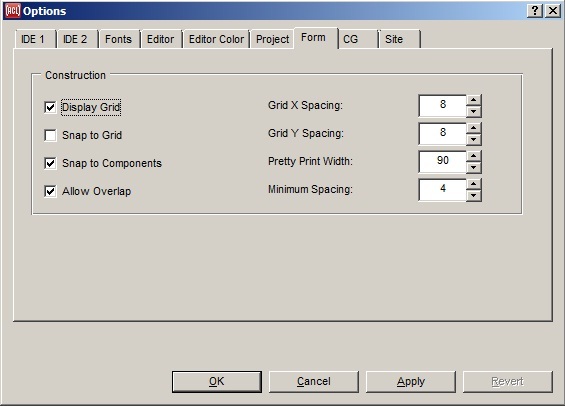 See grid-x-spacing. Grid Y Spacing: the vertical distance in pixels between dots on the grid. See grid-y-spacing. Pretty Print Column: the system writes code which, when run, creates the window corresponding to the designed form. This code is printed to a file with extension .bil. Carriage returns will be placed at this column when necessary so no line of code will be longer than this number of columns. See code-file-pretty-print-columns. Minimum Spacing: if overlapping controls is not allowed, the space between controls must be at least this number of pixels. See min-pixels-between-widgets.